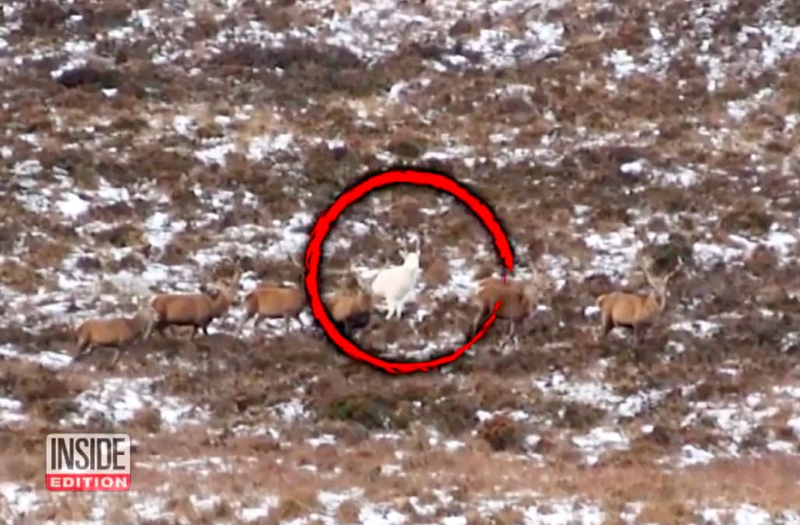 A group of friends has spotted an extremely rare white stag in the Scottish Highlands — only the fourth sighting of this century. Damien Zoyo, Marc Brunelle, Gauthier Aulen and Flavien Valadier were hiking through Cairngorms National Park as part of Zoyo's bachelor party when they discovered the collection of stags, a red deer species, on Jan. 7. But among the animals, Zoyo, who studies biology, noticed a glimpse of white. "We got about 200 meters from them, but it was clear they didn't want us around so they started to walk away,” Brunelle told SWNS News. Brunelle was able to capture the single white stag on camera with the herd. "There were about 200 of them — it was magical,” he said. The ancient Celts considered white stags to be messengers from the afterlife, according to SWNS. Robbie Kernahan, the Scottish Natural Heritage’s head of national operations, told SWNS that the white coloring on the stag is most likely caused by leucism, a rare genetic condition that diminishes the pigments in the hair and skin. Kernahan also mentioned that much folklore surrounds the white stag, including the prospect of good luck. "It was certainly lucky for the person fortunate enough to capture the image on film,” he said. Zoyo and his friends are hoping their discovery brings good luck Zoyo’s upcoming wedding to Caroline Aulen. SWNS reports the location of the white stag remains a secret to protect the animal from poachers. The three other sightings of a white stag were reported on the west coast of the Highlands in 2008, in Argyll in 2012, and last year in Dumfries and Galloway.